Located in the historic San Francisco Presidio, ValueAct Capital is one of the West Coast’s largest investment management firms. 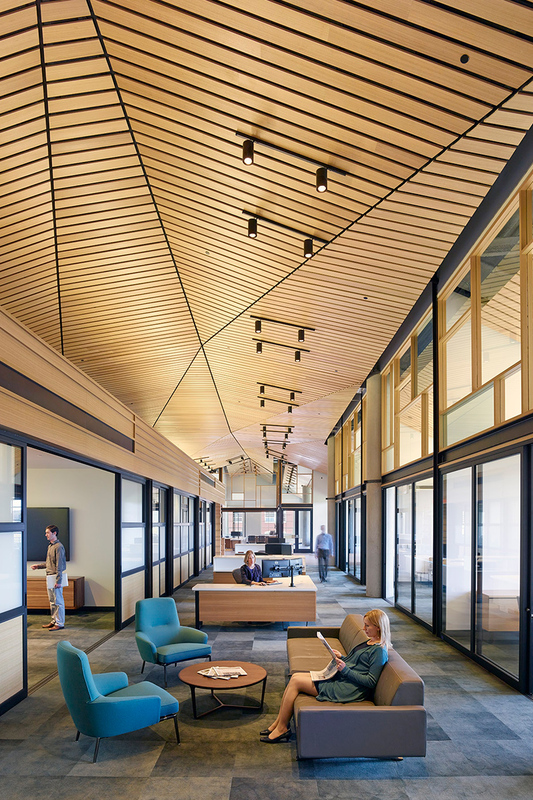 With a new office environment, ValueAct wanted to create balance between the office culture of collaborative ideation space among the sheltered, investment-sensitive offices – a space where ideas could flow freely yet also be contained at the discretion of individuals. In collaboration with ValueAct, Canary + Gould Evans placed priority on visibility into individual offices and throughout the office at-large. This was achieved through use of glass walls, sliding doors and social moments located throughout office areas to encourage casual communication. To resolve competing desires for both collaborative and private spaces, private offices along the perimeter were interspersed with open, shared work areas. The Investor Wing’s generously sized offices are comprised of glass doors that can close for complete acoustical privacy, or remain open to engage with the nearby open offices. A refined elemental material palette creates a warm, modern environment expressive of ValueAct’s culture. 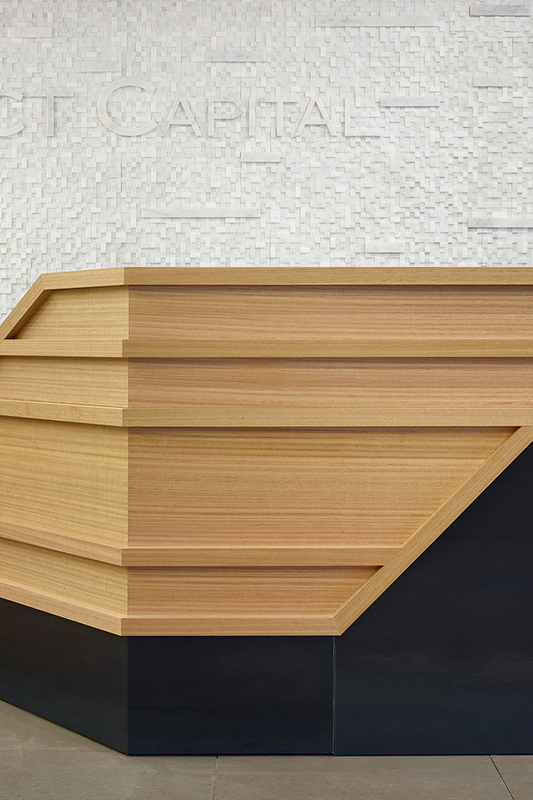 A ribbon wall of board and batten Eucalyptus starts at the reception desk, wraps around the glazed main entry, and proceeds around the entire space. The wall bends to form benches, bars and break out zones that encourage staff interaction and both social and professional dialogue. 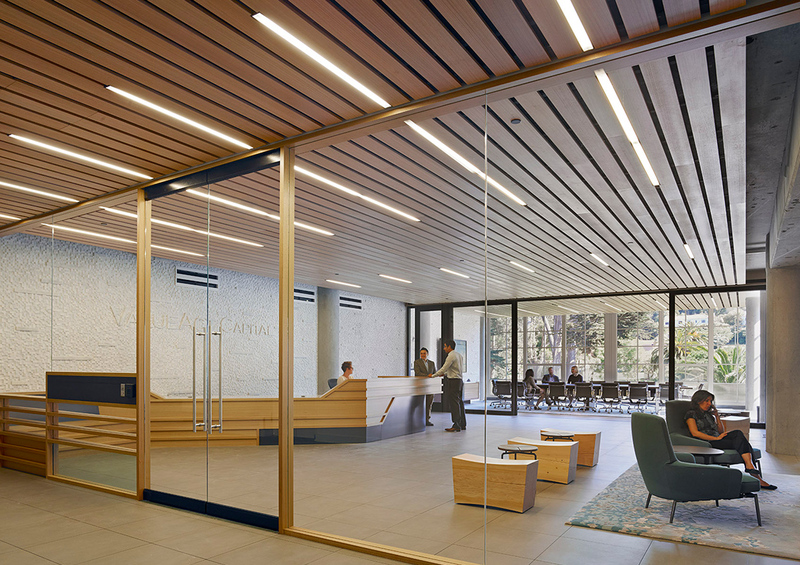 The lobby ceiling is paneled in acoustical Eucalyptus slats, transforming into a dramatic faceted ceiling in the Investor Wing. The choice of Eucalyptus is a historical reference, as the sand dunes of the original Presidio landscape were planted over with a Eucalyptus forest that remains today. 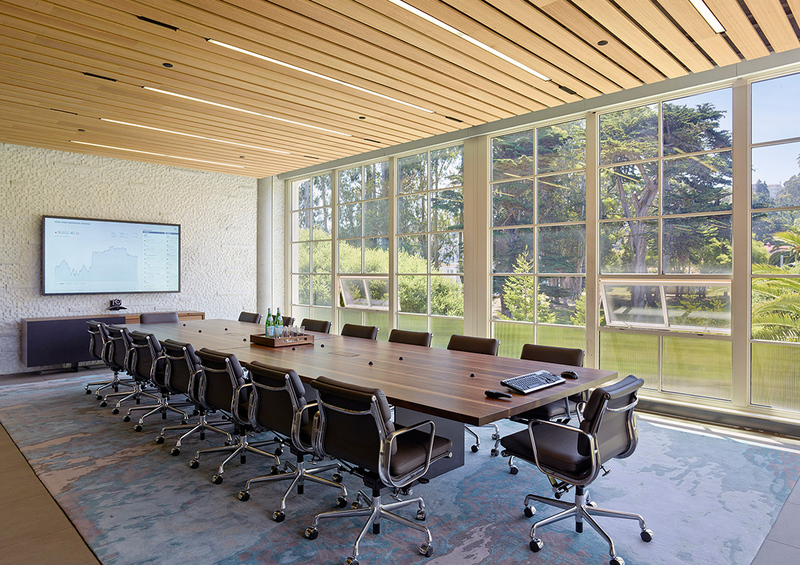 In other areas, a woven metal ceiling and dappled gray carpet contrast against the warmth of the wooden elements. 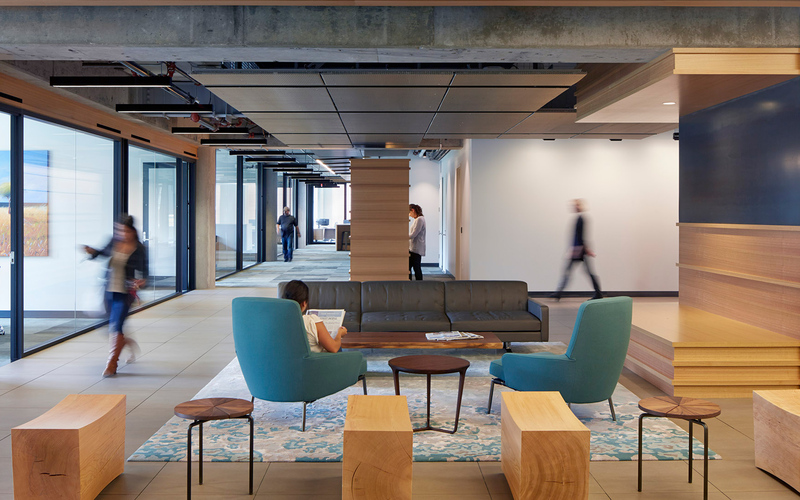 A rarity in the financial sector, ValueAct’s unique vision and collaborative process inspired a new way to approach this historically traditional division of corporate interior design. 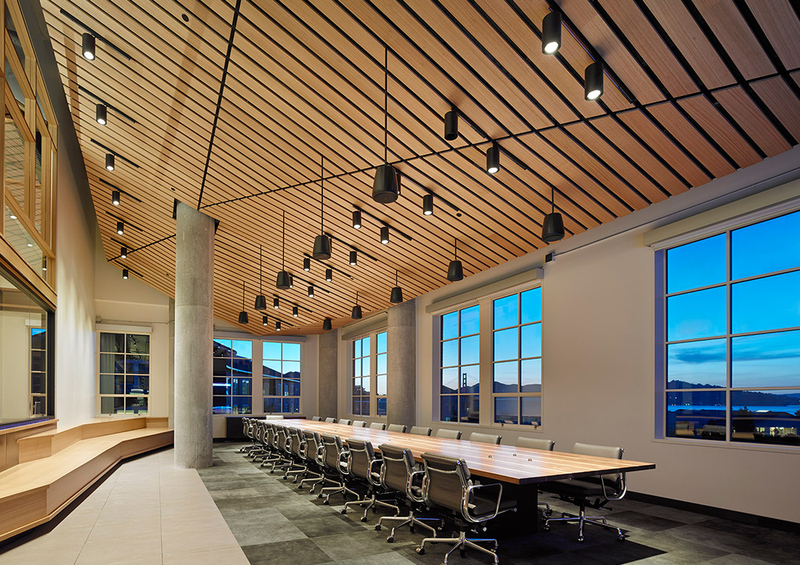 ValueAct Capital exemplifies how we identified the client’s brand, addressed their functional needs and created a beautiful new office environment representative of the existing company culture and forward-thinking mission.